Isn't it great when quality haircare free of harmful ingredients doesn't cost an arm and a leg? 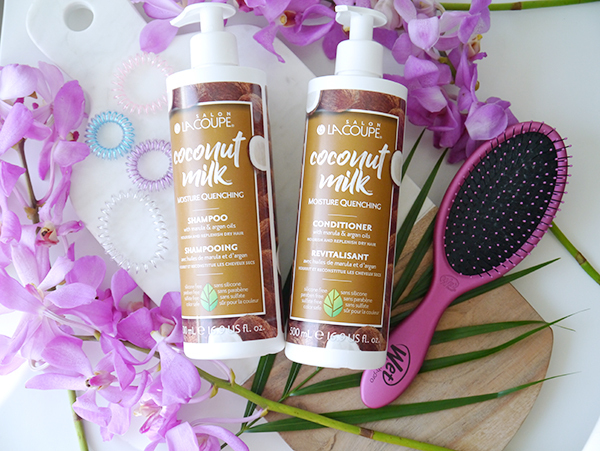 The new La Coupe Coconut Milk Moisture Quenching Shampoo and Conditioner are just that. While La Coupe isn't completely natural, it is free of silicones, parabens, sulphates, DEA, petroleum, and propylene glycol, and the naturals-heavy ingredients list boasts marula and argan oils, aloe leaf juice, coconut water, shea butter, coconut oil, and other botanical extracts. Not bad for under $10 a pop. Aside from the formulas and the price, I love how La Coupe shampoo and conditioner come in generously sized 500 ml bottles with a pump dispenser. I know it's only a minor difference from a bottle or an upside-down squeeze tube, but the pumps are just a couple seconds faster to use than other forms of packaging, and I'm all for saving time during my morning shower routine. 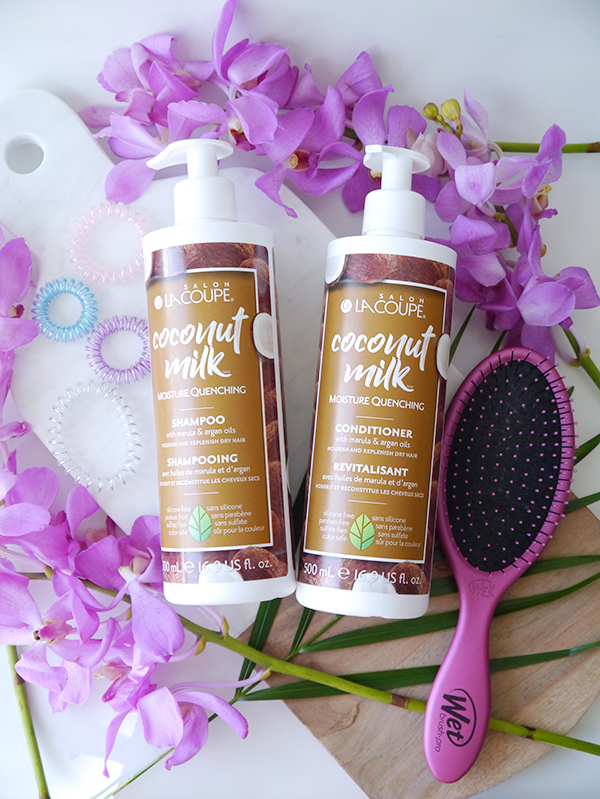 La Coupe Coconut Milk Moisture Quenching Shampoo cleanses without stripping strands of softness or moisture or leaving build-up. It looks white and semi-translucent straight from the pump dispenser but builds to a lovely lather that's comparable to conventional sulphate-laden shampoos. 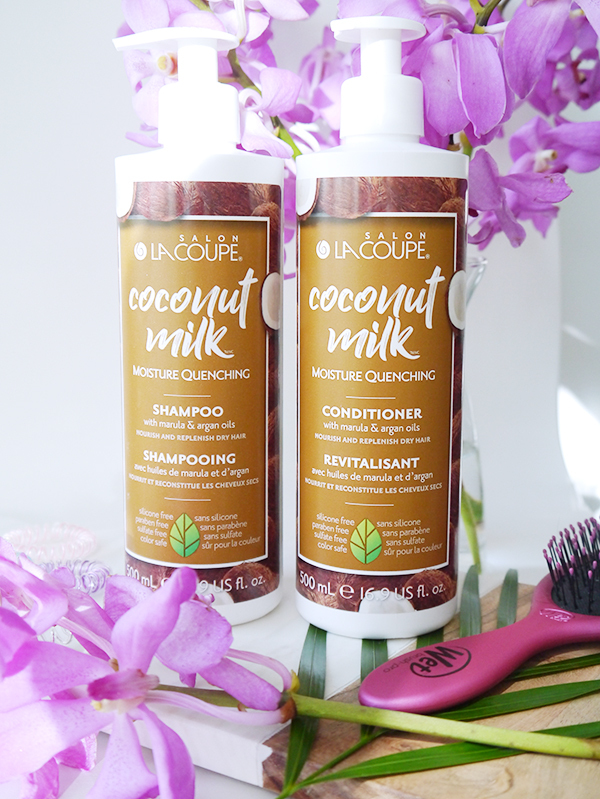 Natural shampoos can have trouble lathering if your hair isn't wet enough or if it's full of silicones and polymers from conventional haircare and styling products, but I never found that to be the case with La Coupe's formula. In the shower I'd concentrate the suds on the roots to really deep-clean away dirt and grease, and then rub the suds down the length of the strands to the ends a couple of times. It rinsed away cleanly and left my hair feeling soft thanks to all the nourishing and moisturizing ingredients in the formula, along with an inviting coconut scent. La Coupe Coconut Milk Moisture Quenching Conditioner is really something else. Usually I go through conditioners twice as quickly as shampoos because I find I need so much more of it to make my hair feel soft. Not so with this one. The formula dispenses opaque, white, creamy, and coconut-scented. I use 4-5 half-pumps, same as the shampoo. It coats every single strand but manages to feel light and weightless at the same time. Don't let the weightlessness of the formula fool you though: It's chock full of nourishing oils as evidenced by the fact that the floor of my bathtub always feels quite slippery when I rinse this conditioner off. It doesn't rinse away completely and leaves the lightest hint of moisturizing oil behind. My hair isn't particularly prone to tangling when wet so I was skeptical that I'd enjoy the Wet Brush, but wow does this brush beat the regular drugstore plastic hairbrushes with the little ballpoints on the ends of plastic bristles. While the Wet Brush looks almost identical to the latter, it features ultra-flexible bristles that bend and give and positively glide through wet hair, detangling with ease while minimizing breakage and tugging. 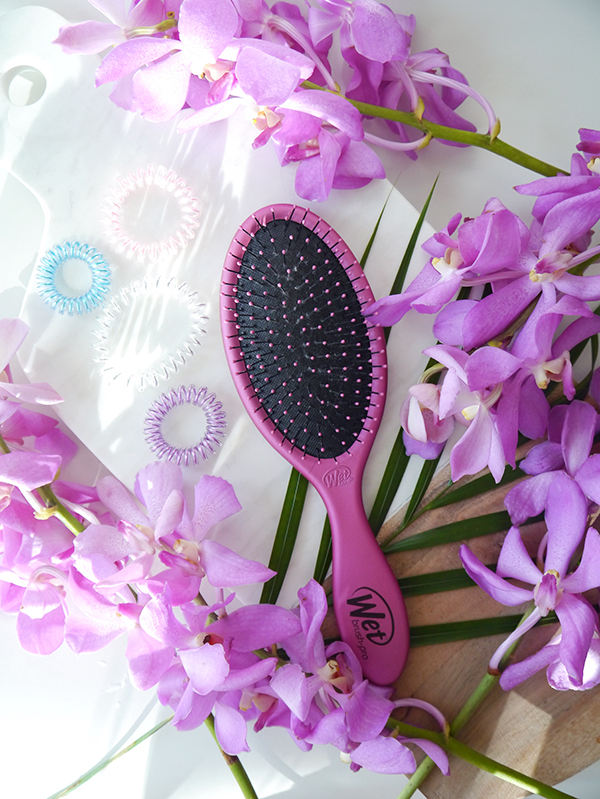 The flexible bristles combined with the tiny ballpoints feel like the gentlest mini massage for the scalp every time I brush wet or dry hair, and unlike conventional plastic bristles they don't scrape, dig, or pull. I loved the Wet Brush so much, after using it for about a week I parted ways with my old hairbrush for good! Spiral hair ties are apparently 2000% more popular this year and for good reason. They provide a secure hold that's not too tight or headache-inducing and they don't leave dents in your hair, so you can go from work to workout to dinner plans without ruining your blowout (always a plus!). 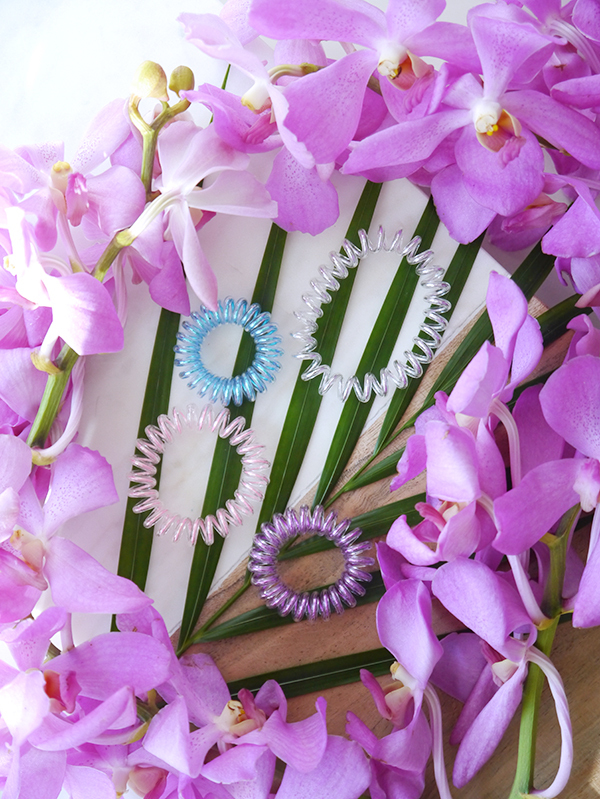 We have Invisibobble to thank for the first ones on the market, but since they launched a couple of years ago other hair accessory makers have caught on and the style is more widely available these days. I'm a late adopter who only started using these hair ties earlier this year when Chatters kindly sent me a couple packages of KB Collection Traceless Hair Ties, but now I can't imagine going back to my old ones. Even with my hair type (thick, heavy, slippery Asian hair that constantly slips out of elastics and clips), they have enough grip to keep my hair out of my face when I'm in front of a computer or in barre class. The ones shown here are the small size, which feel more secure in ponytails. As you can see, they do loosen up with use, but I find that rotating between hair ties and letting the used ones "rest" for a couple of days will allow them to tighten up to almost as good as new. Good thing there are 3-4 to a pack.